Let us suppose it is high profitability. In this case it is good to know that the 950F is designed for top capacity even under difficult conditions. We also know that good service is a prerequisite for trouble-free work. For this reason we have designed a service-friendly forwarder and established many service centres. All these factors guarantee for a reliable machine and increased profitability. The ergonomically designed work place with all displays and controls within comfortable reach offers comfortable working conditions. For further information click on a square in the picture to the left. Or click the button "Start guide". The large far downward reaching panes offer excellent visibility. You can see the wheels without having to lean out. The short nose is not in the way nor does it sweep out and thus offers narrow angles of passage. The IQAN Experience now features a large and more clearly arranged colour screen. The controlled movements of the boom are still more exact and you can easily adjust the boom to your own mode of operation. Five operators can set their own individual programme. By means of the Power-shift you can shift gear without having to stop, even with full load. The average speed is increased, and you can drive at low economical revs.. The gearbox of the 950F is a 2-steps gearbox. The bogie-lift (our most popular option) offers advantages in many situations and reduces the turning radius. The 950F is equipped with 8 wheels arranged for optimum weight distribution in the natural home of the forwarder, the forest. 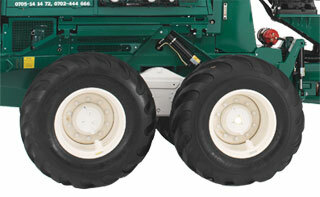 As standard the 950F is supplied with '600/50x22.5' tyres. Optional are tyres are 650/45x22.5 or 710/40x22.5. 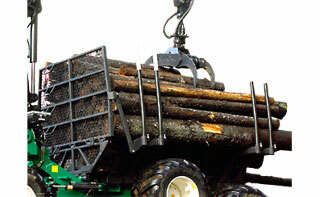 The two hydraulic cylinders of the waist lock keep the rear frame in position even if the grapple is full of heavy timber in maximum slewed position. Even if the rear section is inclined and holds no load. It is easy to pick up logs even under difficult conditions. The large loading space permits ten tonnes loading capacity - highest in its class. The headboard is hydraulically operated and offers excellent view regardless of how the rear section is angled. 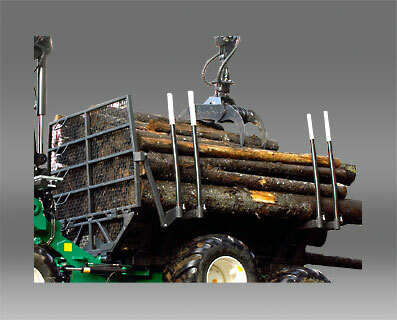 The two back banks are infinitely adjustable to enable you to easily change from short stumps to long logs. The loading space is, dependent on the banks profile, adjustable between 4.1/3.3 m² and 4.3/3.5 m². In addition to the standard crane, Loglift 51 F (6.5 metres), four other more powerful cranes are available as options (Loglift 51 F - 8.7 metres, Loglift 59 F - 7.2 or 8.5 metres with or without tilting base & Cranab CF 80 - 7.2 or 9.2 metres). With the crane on the rear frame, you experience fewer harmful crane vibrations in the cab. The location of the crane in relation to the articulated joint does not only produce a shorter, more versatile machine, but also means that the reach at full extension is increased by a whole metre. With the boom positioned on the rear frame harmful vibrations into the cab are reduced. The position of the boom in relation to the waist not only results in a shorter and more supple machine, but also in an increase of the reach by a whole metre, when the boom is slewed to maximum. 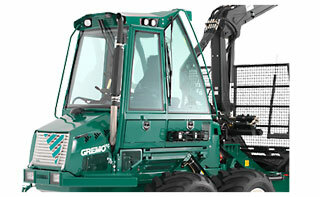 As standard the 950F As an option other types of grapple are available. Why not add an efficient gyratory movement damper making the grapple hang steady even with fast movements of the boom? 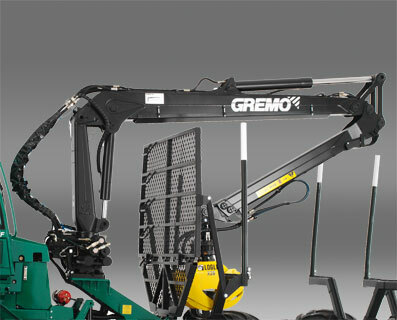 We at Gremo can help you to choose the right type of grapple just for your purposes. 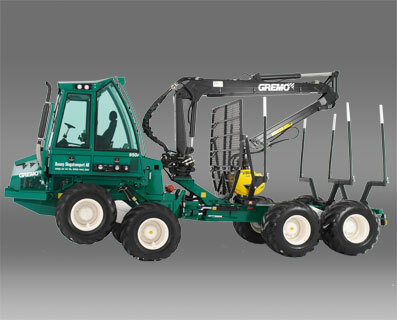 The 950F is a new forwarder based on the approved previous version 950R. It has a re-designed cab with curved panes for improved visibility, new fittings and improved sound insulation for better working conditions.The short front section does not obstruct the view neither does it veer aside and provides an advantageous ramp angle. The re-designed control system where you can check and adjust all important functions via colour screen.. The setting of the boom control is simplified still. Possibilities for trouble shooting are available too. 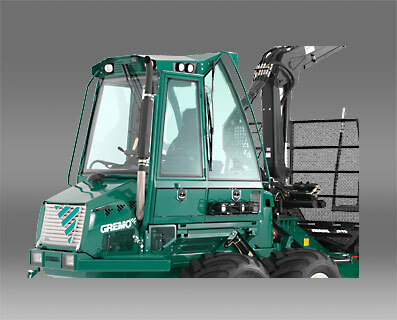 The Gremo 950F is a compact, supple and flexible forwarder for thinning and minor final cutting. The forwarder is designed for thinning applications, but is well suited also for timber, brushwood transport and work on wetland. The well thought-out design, carefully selected material and components guarantee highest possible quality, performance, ergonomics and service-friendliness. In short: A reliable companion in the forest. The bogie-lift (our most popular option) offers advantages in many situations and reduces the turning radius. 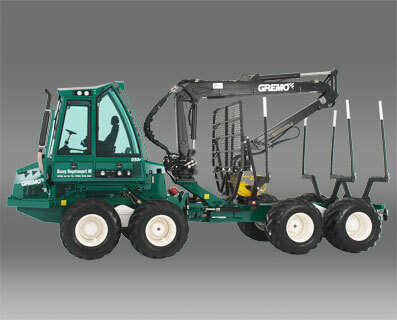 Owing to the reduced turning radius it allows for narrower turnings in tricky thinning terrain. By lifting a pair of wheels you can move on roads with a couple of chains in the air. You can also lock the bogies when passing a ditch. Let imagination play and proceed by trial and error in different situations. The 8 wheels are arranged in such a way that the weight distribution is well adjusted for all applications and gives the machine good balance and excellent stability. 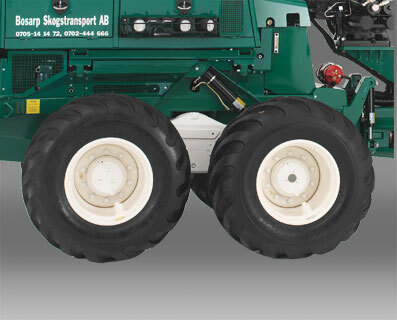 As standard the 950F is supplied with 600/50x22.5 tyres. Optional are tyres are 650/45x22.5 or 710/40x22.5. The large downward extended window panes provide supreme visibility. You can see the wheels without having to lean out. Xenon lights are standard.The picture shows the low side lights - the two lights on each side above the wheels. They are arranged in low position to lighten up long way under the branches, for instance when thinning in a dense forest. To make your work safer and more comfortable the machine is rearmost furnished with a ramp with Xenon working lights, blinkers and tail lights. Here is also the rear vision camera. Apart from the standard boom Loglift 51 F there is an option of two stronger booms (7.2/8.5 m and 7.2/9.2 m). 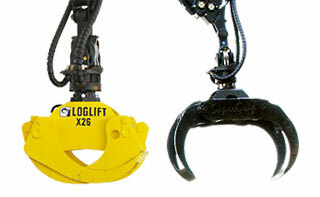 The reach of the Loglift 51 F is as standard 6.5 metres, the gross lifting torque is 59 kNm. As an option this boom can be supplied with 8.7m reach. 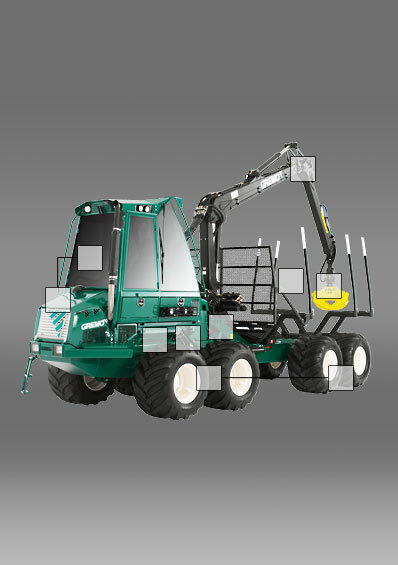 With the boom positioned on the rear frame harmful vibrations into the cab are reduced.. The position of the boom in relation to the waist not only results in a shorter and more supple machine, but also in an increase of the reach by a whole metre, when the boom is slewed to maximum. 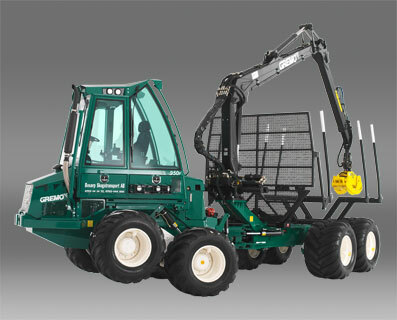 As standard the 950F is supplied with the Hultdins SG 260 grapple, shown to the right of the picture. 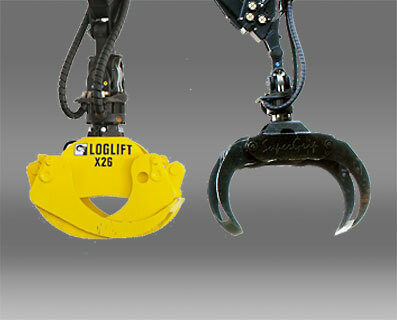 As an option other types of grapple are available. Why not add an efficient gyratory movement damper making the grapple hang steady even with fast movements of the boom? 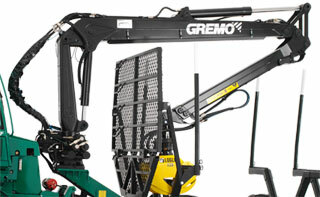 We at Gremo can help you to choose the right type of grapple just for your purposes.